Chelsea entered the Premier League match as favourites and duly delivered on it in the early stages of the game. Unai Emery's men tore Arsenal's defence apart in the first 20 minutes as Pedro surprised the Gunners with a deft finish while Alvaro Morata doubled Chelsea's lead with a sublime goal past a hapless Petr Cech. Chelsea emerged as eventual winners on Saturday after a gruelling encounter with Arsenal at Stamford Bridge. Fullback Marcos Alonso was instrumental in Chelsea’s 3-2 victory as he notched up a goal and an assist. Alvaro Morata and Pedro were also on the scoresheet for the Blues. Arsenal made an incredible fightback in the first half courtesy to Henrikh Mkhitaryan and Alex Iwobi’s goals but it was just not enough in the end. Maurizio Sarri’s men entered the Premier League match as favourites and duly delivered on it in the early stages of the game. Chelsea tore the Gunners’ defence apart in the first 20 minutes as Pedro surprised Arsenal with a deft finish while Alvaro Morata doubled Chelsea’s lead with a sublime goal past a hapless Petr Cech. However, it did not take long for Unai Emery’s men to impose their authority in the match. The front line of the Gunners’ came back to life in the final 10 minutes of the first half as Mkhitaryan and Iwobi scored two quickfire goals to level the score. Emery introduced Lucas Torreira in the second half in place of Granit Xhaka, who was on a booking already, to add some energy and steel in the midfield but it apparently went in vain. Chelsea held Arsenal’s game by the neck throughout the second half and the introduction of Eden Hazard further piled misery on the visitors. Hazard was too hot to handle for the shaky Arsenal defence and they were duly punished in the 81st minute by the Belgian talisman who created a fantastic opportunity for Marcos Alonso who buried the ball into the net. 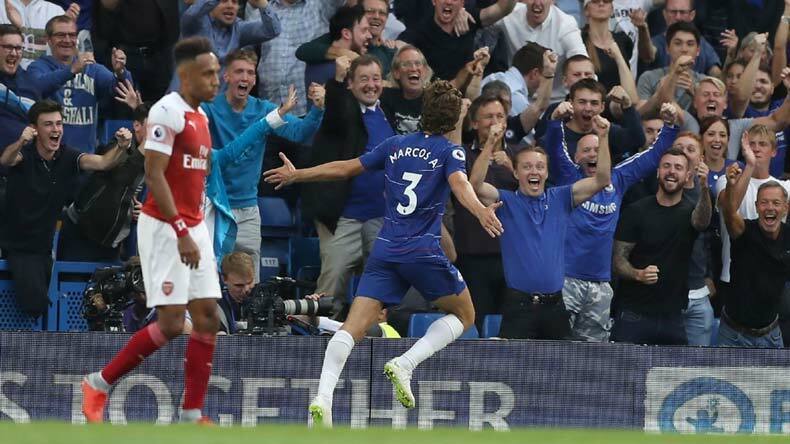 With the thrilling 3-2 victory, Chelsea has made it two wins in two matches played while Unai Emery is yet to taste victory with Arsenal in the Premier League 2018-19 season.